Sparky’s favorite breakfast dish in the whole- entire- wide -world ( that’s covering a LOT of territory!) are Fritattas. And boy oh boy, are they ever tasty! 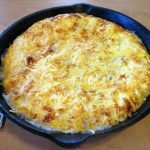 A Fritatta is really nothing more than an Omelet where all the ingredients are mixed into the eggs instead of being a filling for the eggs. Once the eggs are set, you just pop it under the broiler until it is warm and bubbly and maybe just a little brown on top. The best part is that they can be made with just about any leftover vegetables and meats in your fridge or I as did this time, a planned Cauliflower and Ham Fritatta. 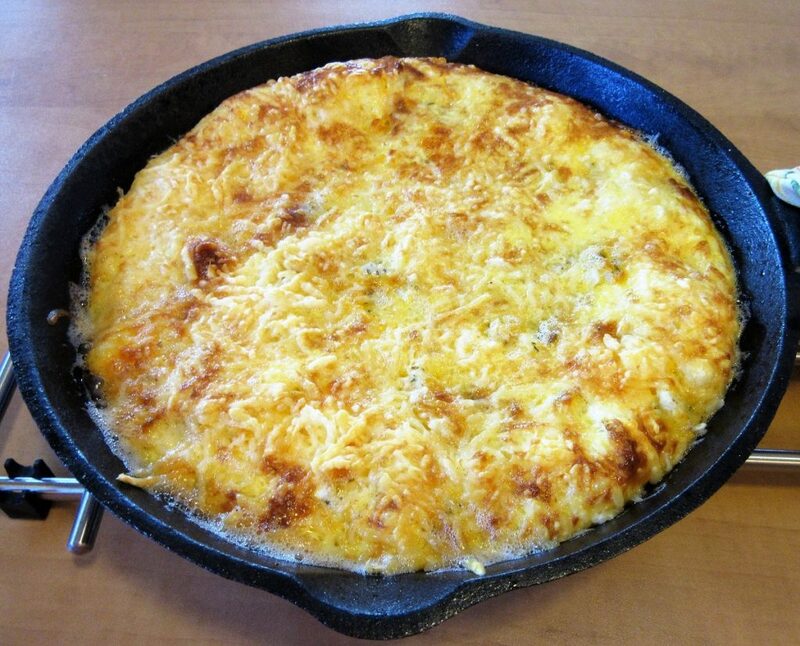 I cook our Fritattas in a heavy 10 inch Cast Iron Skillet, but you can use any skillet you like as long as it can go under the broiler for a couple of minutes. 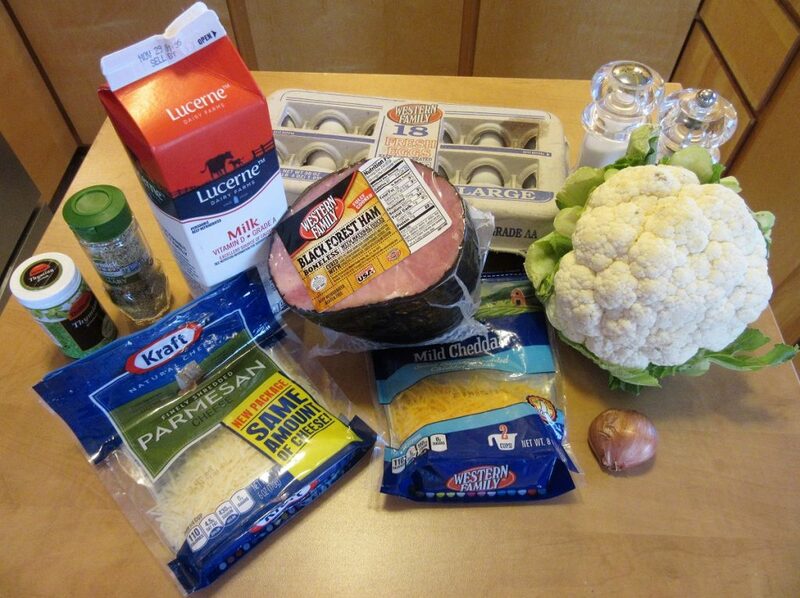 This Cauliflower/ Ham version is Dan’s absolute favorite and we both love the flavors and texture. You know, one of my favorite cooking tricks is to prepare everything in advance and set it all aside. That way when I start to cook, there is no stopping and looking for ingredients or stopping to prep an ingredient for the next step. Just bing, bang, boom and it’s done! Full of crisp bite size morsels of Cauliflower. 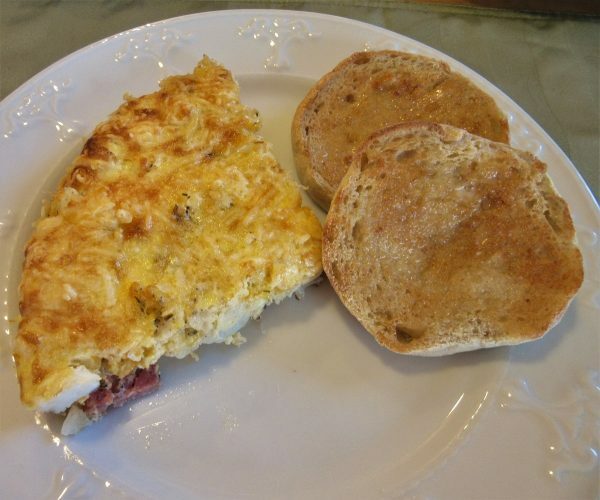 Flavored with diced Ham and seasoned just right with Rosemary and Thyme this egg rich dish will start your morning off on a real happy note! PRE-Heat your broiler! 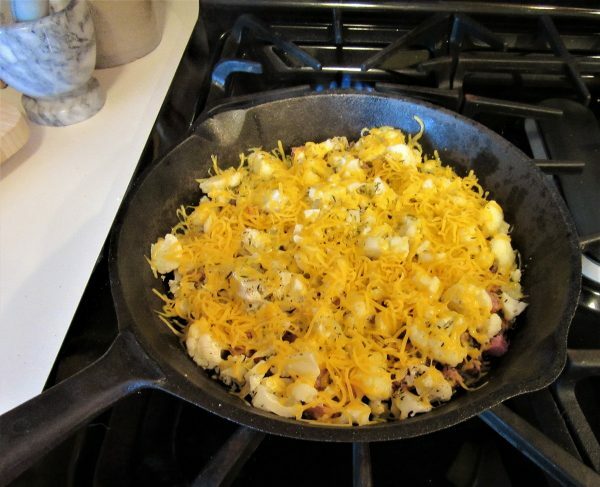 In a 10 inch oven proof skillet, over medium heat, melt together the Butter and Oil. 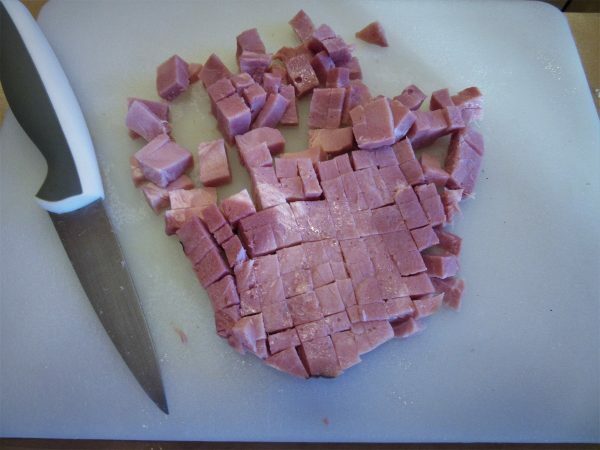 Dice up the Ham and set it aside. Add the Onion to the skillet and cook, stirring frequently until it is soft but not brown. Spread the Onion evenly in the bottom of the pan. 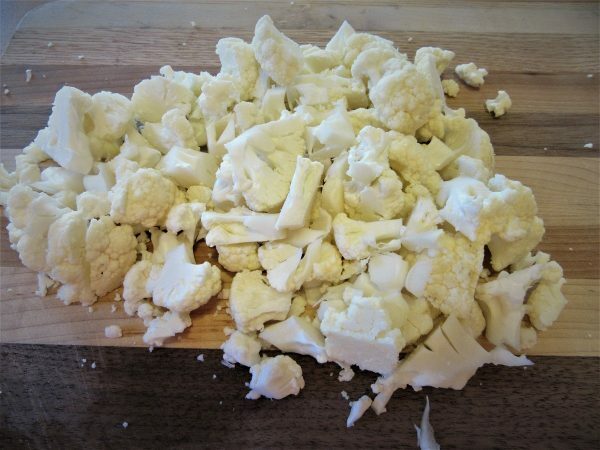 Sprinkle the Cauliflower evenly over the Onion and let it cook for 2 minutes or so. 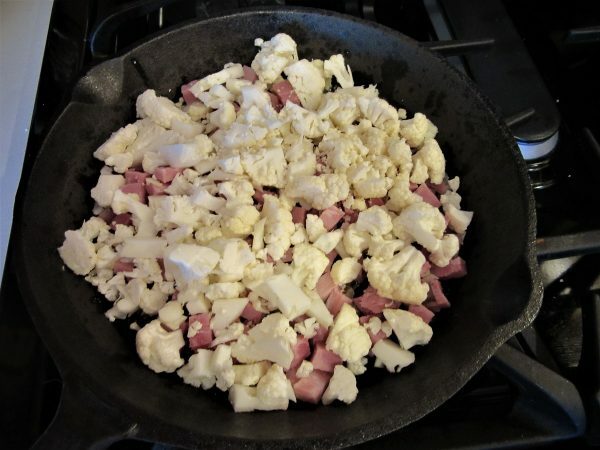 Then sprinkle the diced Ham evenly over the Cauliflower and let it cook another minute. Sprinkle the Salt, Pepper, Rosemary and Thyme evenly over all the skillet ingredients. 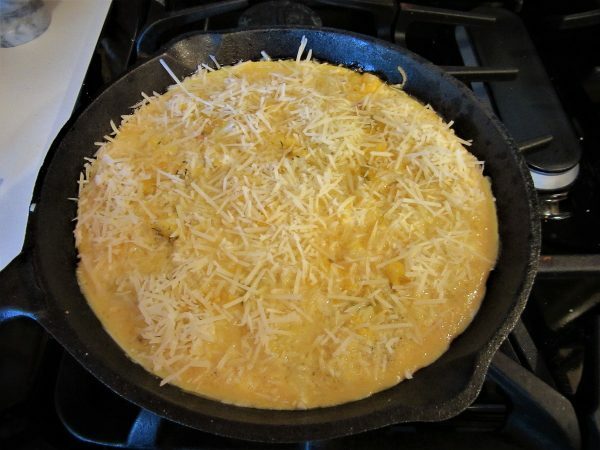 Then spread the shredded Cheddar Cheese over top. 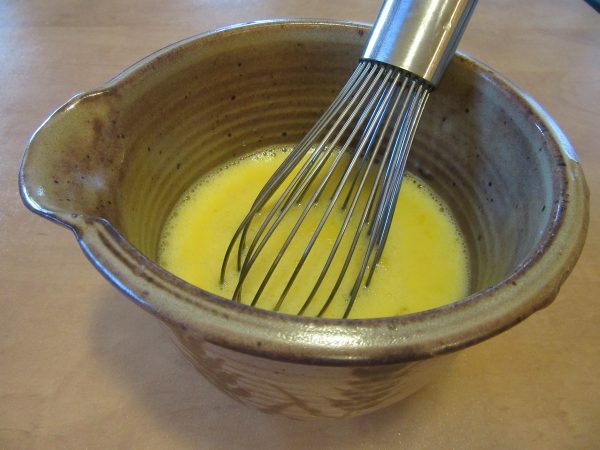 Whisk the eggs with the 2 TBSP Milk until well combined and pour evenly over the ingredients in the skillet. Cook over low heat just until the eggs are almost set on top. Remove from heat and sprinkle the shredded Parmesan Cheese over the top. Please the skillet in the oven about 3 inches under the pre-heated broiler. Broil 2-3 minutes until the top is bubbly, and light brown. Remove it from the oven and cut the Fritatta into quarters and serve! So, so yummy! Wherever your journey takes you today, I hope this day and all your days start with something tasty and served with love. Thanks for stopping by today. Journey on! can I use a oven proof glass dish or other baking dish for this. I do not own a cast iron skillet or one without the plastic/type handles. thank you.